I love the moment when you realise that you have been utterly seduced an artist's work, when you had little or no expectations of what you were coming to. James Powditch, in his new show Superpowers at Australian Galleries in Paddington, has created something so witty, complex and layered that it seduces us easily. 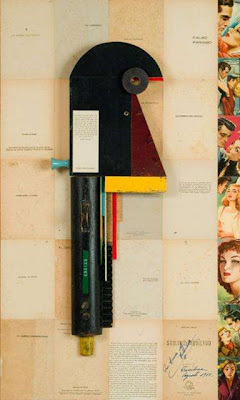 The show is a collection of twenty five, quite large, collage pieces that are framed and hung as if they were paintings. The individual pieces represent countries ('Made in Great Britain', 'Made in Japan', 'Made in Netherlands') each of whom have hosted the Olympic games. This is a smart and useful distinction. For all its rhetoric the Olympic's represents an oddly potent mix of old-fashioned nationalism and modern image building, both of which emphasise the thoughtfulness of some of these works. 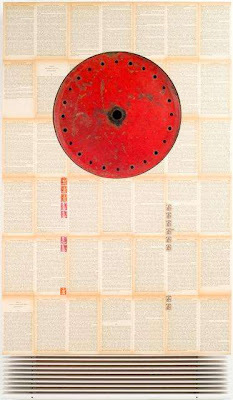 Japan is represented by a red pulley wheel, in 'Made in Japan II', and the pages of a text that waxes about its post war economic miracle. The wheel is an easy spot for the rising sun, but the whole piece also reflects the tension in Japanese visual culture between the ascetic and the ornate. The result does just enough to draw the divergent ideas we have of modern and traditional Japan together. 'Made in Germany - Berlin 36' puts us beneath the Brandenburg gate and set of rulers that rise up vertically and would make Albert Speer proud. The sense we are left with is of a technocratic brutality within an historic culture. Rulers and measures are common place in Powditch's pieces. It is as if he wants to measure out cultural time, to find an empirical way to communicate universally. These are also common objects that remind us of how we have abandoned the aesthetics of craft. It might also be as simple as their tactile and visual qualities, there is something beautiful about these everyday objects, their grooves and typefaces, the lamination and patina. They feel well used and human, it gives us a link into the object. An obvious reference point is Joseph Cornell, whose boxed assemblages of found objects are small treasures of the Twentieth Century. However Cornell's is a private world, each box feels like a window into his sub-conscious and the obsessive compartmentalization felt like it might be pathological (a suspicion strengthened by his attraction to surrealism). Powditch's is a more public world, the layers of image and reference describe a cultural life not a private one, 'Superpowers' is a conversation about shared meaning and memory. When we look at the 'Made in Australia, Lake Burley Griffin' it's hard not to think of Rosalie Gascoigne. The same attraction to meaningful detritus is there, but Gascoigne's work always looks as though the words and patterns arising are accidental (I never assumed they were, just that I was supposed to). Powditch is far more structured. 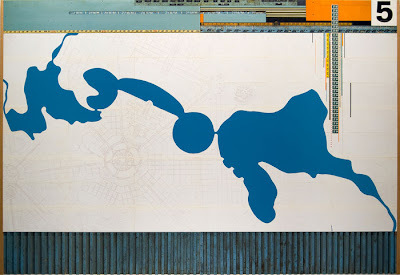 Typically his work has a single strong geometric feature that sits above, or on the edge of, a field of tiled paperback pages or other ephemera. This makes the work feel much more sculptural than graphic. At the same time it is possible, literally, to read each piece and once you get past the novelty of recognizing individual elements you start to pick out echoes and half intentional meanings. The deep, dark wooden cases that each piece sits in lend them the air of an old school house or museum. This sensitive framing is as much a part of their success as what sits within, it gives tat and trash gravitas. However it's Powditch's eye that really makes this all work together because he has a strong formal sense. A myriad of detail never overwhelms his strength of composition. In 'Made In Spain', one of a serious of works where single 'objects' dominate centre and middle, an object that might reminds us of a spanner or an eagle's profile sits upon a background of romantic fiction, it reminds us of a darker side to Spain's history, of blood and power. These works are both topography and archaeology. The printed page is made strange as it is encased in glass, so that we might be looking at a zoological specimen. What this does is make us more aware of the way our culture has been indelibly marked by such small artefacts and acts. Fruitboxes, stamps, pulp novels and the maps we remember from our childhood are more important than officially sanctioned narratives in forming our notions of nations. What Powditch does here is heighten that sense of democratic images and remind us of a time, somewhere in our own or the historical past, when the rest of the world felt different and exotic. In doing this he taps into our innate curiosity and has created works that invite and encourage a deep interaction, it is very very good.